Oil prices have reached fresh highs as traders await the release of new US stockpile data. US light, sweet crude climbed 58 cents to $62.47, while Brent crude rose 55 cents a barrel to $61.25, before both benchmark prices dropped back slightly. 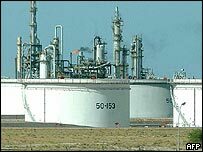 US refinery shutdowns and the hurricane season in the Gulf of Mexico and Caribbean are hitting reserves. Gasoline supplies fell for this time of year on strong demand and slower refinery output, the government said. Its update of oil and petrol stocks on Wednesday showed gasoline stocks fell by more than expected. However commercial crude stocks showed a strong build up and rose by 200,000 barrels nationwide to 318 million barrels last week. Oil imports neared 11 million barrels a day, according to the federal Energy Information Administration. Oil prices last broke records two days ago, after the death of King Fahd of Saudi Arabia - home to a quarter of the world's oil. Concerns over Iran's nuclear ambitions have also bolstered oil prices in recent days. Iran, the second largest oil exporter within the Opec producers cartel, is at loggerheads with the US over plans to resume the processing of uranium. Investors fear this could increase political tensions and affect oil supplies. The US is opposed to Iran's plan to resume uranium processing, which Iran claims is necessary for its domestic energy needs. Iran produces about four million barrels of oil a day, making the country a vital source of supply for major energy consuming nations.